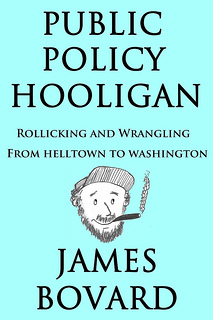 Fifty-nine days before the FBI final assault, scores of federal Alcohol Tobacco and Firearms agents launched an attack on the Davidians’ home spurred by allegations that they had converted semi-automatic rifles to full-automatic capacity. The ATF’s lead investigator had previously rejected an offer to peacefully search the Davidians’ home for firearms violations. Four ATF agents and six Davidians were killed in the fracas on February 28, 1993. At least one ATF agent told superiors that the ATF fired first, spurring an immediate end to the official shooting review. But the media trumpeted the ATF storyline that its agents had been ambushed, entitling the feds to be far more aggressive in the following weeks. Shortly before the Waco showdown, U.S. government officials signed an international Chemical Weapons Convention treaty pledging never to use nerve agents, mustard gas, and other compounds, including tear gas against enemy soldiers. But the treaty contained a loophole permitting governments to gas their own people. On April 19, 1993, the FBI pumped CS gas and methyl chloride, a potentially lethal, flammable combination, into the Davidians’ residence for six hours, disregarding explicit warnings that CS gas should not be used indoors. Orwellian language will vaporize federal aggression. As Abrams tanks driven by FBI agents continually battered the Davidian’s home, FBI loudspeakers endlessly broadcast: “This is not an assault.” Prior to the fire, the tanks had collapsed 20 percent of the building atop its residents and the FBI planned to totally demolish the home. Grenade launchers on the tanks and other armored vehicles fired almost 400 ferret rounds of CS gas through the thin wooden walls and the windows of the building. Yet Attorney General Reno later insisted: “We didn’t attack. We tried to exercise every restraint possible to avoid violence.” Demolishing someone’s home was supposedly no more bothersome than leaving a Federal Express package on their doorstep. Truth delayed is truth defused. The FBI speedily asserted that the Davidians ignited the fire that consumed their dwelling. The following day, the President Bill Clinton deriding suggestions that Attorney General Reno “should resign because some religious fanatics murdered themselves.” Six years later, independent investigators found pyrotechnic ferret rounds the FBI fired at the scene prior to the flames erupting. Attorney General Reno lashed out at the FBI for destroying her credibility but neither she nor FBI officials suffered any consequences from the collapse of the official narrative. Don’t trust Congress to expose federal misconduct. A few days after the conflagration, Reno was heartily praised at a Senate committee hearing and the media had made her a national hero. There was little or no sympathy on Capitol Hill for those who died during the final FBI assault. Rep. Jack Brooks (D-Texas), chairman of the House Judiciary Committee, commented that the Davidians were “horrible people. Despicable people. 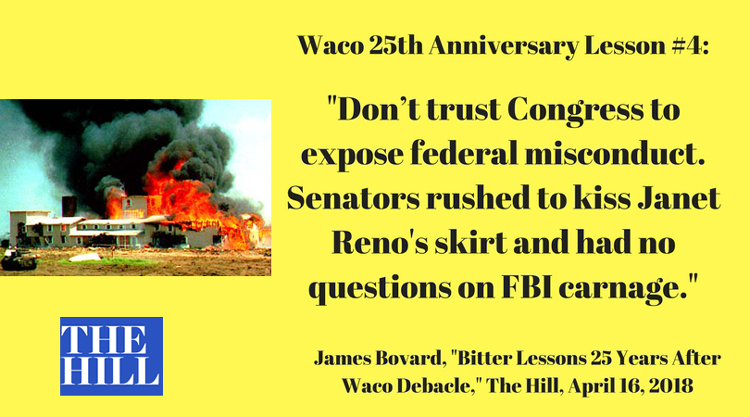 Burning to death was too good for them.” If Republicans had not captured control of Congress in 1994, there would have been no substantive hearings on Waco. Media favorites can perform rhetorical magic tricks. 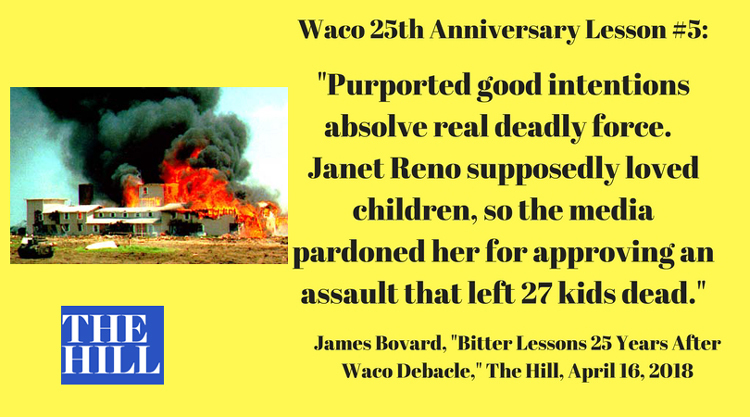 When Attorney General Reno testified to the House Waco hearing on August 1, 1995, she was challenged on FBI’s use of 54-ton tanks to assail the Davidians. Reno replied that the tanks were “not military weapons… I mean, it was like a good rent-a-car.” When Rep. Bill Zeliff (R-N.H.) challenged her, Reno hectored: “I think it is important, Mr. Chairman, as you deal with this issue, not to make statements like that can cause the confusion.” This is the high-toned D.C. version of the old saying: “Who are you going to believe — me or your lying eyes?” Media coverage of Reno’s showdown with congressional Republicans ignored her rent-a-tank absurdity, instead praising her toughness and demeanor. 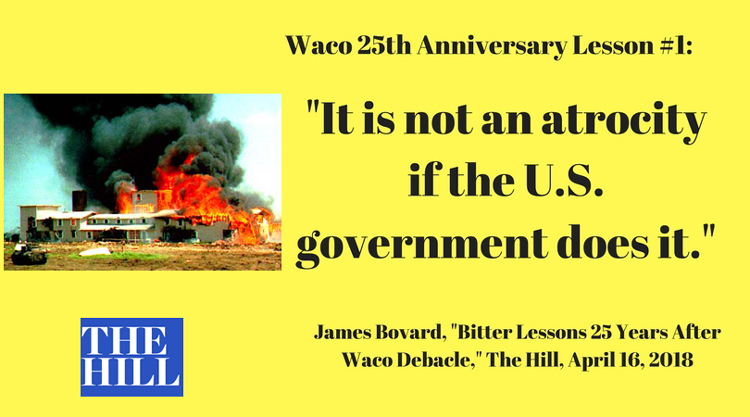 While the events at Waco alienated millions of Americans from the government, few if any lessons were learned in Washington. 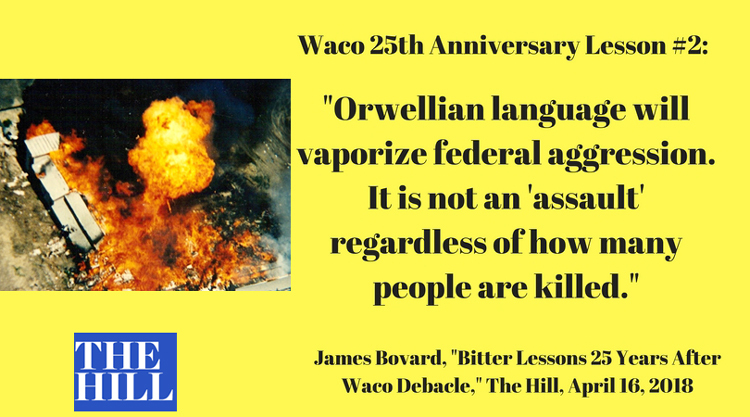 Waco should have taught the disastrous consequences of unleashing government agencies from the law and the Constitution. Unfortunately, 25 years later, controversies are raging as hot as ever about the power and prerogatives of federal law enforcement. The fact that the Bundy Ranch fiasco ended without bloodshed show that the Leviathan *may* have learned *something* from the Waco debacle. Even if that lesson was only, ‘Don’t massacre citizens while there are *any* cameras around,’ given the ubiquity of cameras today, that may be a good thing. FBI snipers were posted around the Bundy Ranch before the deluge of cameras arrived. Happily, no one got killed that time. Amazing that the FBI lied to the Bundys, federal judges, and American public for almost 4 years about the deployment of those snipers — which finally came out late last year. Janet Reno is dead and it’s a pity there is no hell for her to go to. I saw an article by Rachel Blevins about how nobody bombed America after the President attacked his own people with chemical weapons back in 1993. No regime change operations, no foreign mercenaries hired to kill Americans, no missile strikes on important weapons sites, nothing. Why the hell weren’t those damn Russians dropping humanitarian bombs or something? Where was Saudi Arabia or Israel to help save us from a mad man? China made no effort to protect Americans from the killer President. Certainly, the Europeans could have stepped up and put peacekeepers on the ground here to prevent more attacks against children with chemical weapons. Face it, even though the U.S. is the first one ready to drop some humanitarian bombs when an evil-doer is even suspected of doing evil, no nation is willing to risk the lives of their soldiers or incur debts to help Americans when we are under attack by a lunatic with chemical weapons. Maybe the foreigners were getting their information on the Waco finale from the Washington Post, so they assumed the FBI had merely conducted a humanitarian intervention.